As if Amsterdam Dance Event, the electronic music mecca of Europe and the world’s largest festival of its kind, weren’t packed enough already – there’s more. 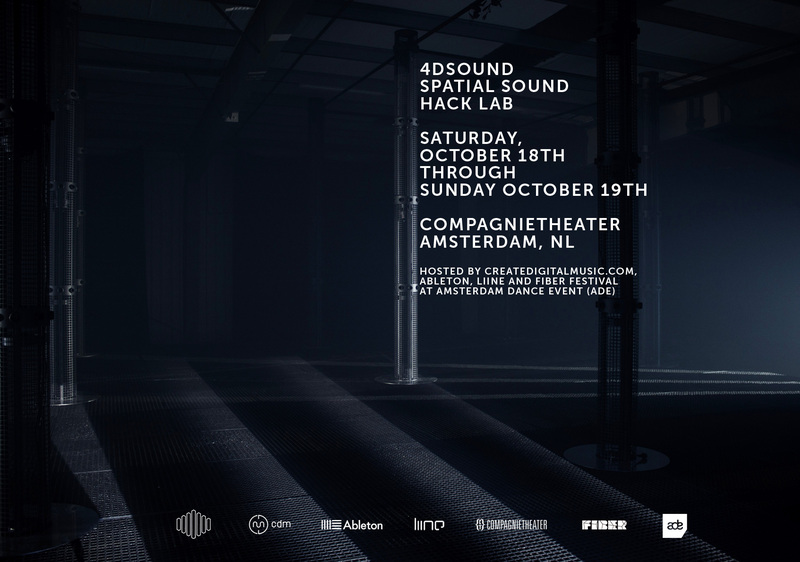 Tucked inside the festival we’ve got five days of programming devoted to spatial audio, on the 4DSOUND system. 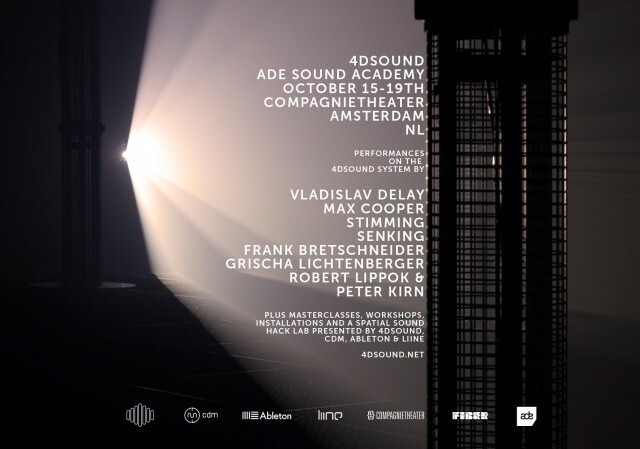 As part of ADE Sound Academy, itself focusing on threads between technology, practice, and music, the event at Amsterdam’s Companietheater will explore the frontiers of new settings for music and sound. From plumbing the possibilities of the 4DSOUND’s forest of speakers to opening a discussion of immersive sound and music now and in the future, a combination of master classes, hands-on workshops, and live performances will challenge us to imagine what is possible as music fills new environments. Meeting that challenge necessarily requires us to be engineers and artists, teachers and students, all at the same time. So I’m humbled to myself be involved in this program variously from all those perspectives, as an artist venturing into connections between architecture and music with Robert Lippok (Raster Noton), and via CDM, hosting discussions on how to push this and other technologies forward. And you can be, too. 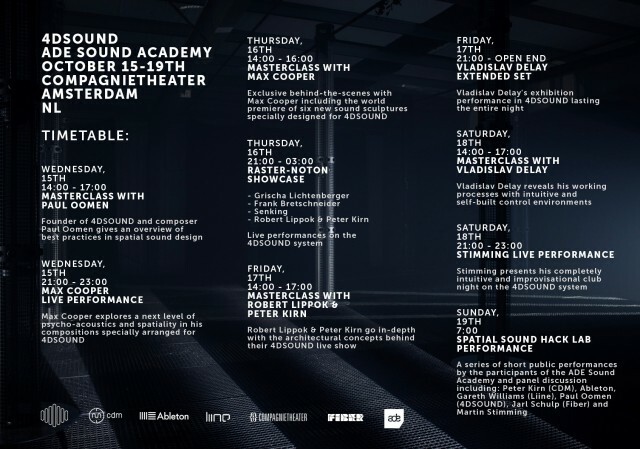 The event is open to public attendance during ADE, and because we want your input, CDM is hosting an open call for participants to join us on a weekend-long Hack Lab. In that laboratory, limited in participation to facilitate maximum collaboration and time on the system, we’ll get to see what we can discover in finding new ways of exploiting spatial sound (and visuals). Tickets are available now; we’ll have more on that soon (including whether a pass to the five-day program is available). But one way to get into all of it free is to apply for the Hack Lab – below. ADE pass holders have limited access to the event, but capacity is extremely constrained; first come, first served. Also, Max Cooper is the one gent who has done a binaural recording so that – provided you have headphones on – you can experience a pathway through the work. Also worth watching Lucy’s take on the system, which made use of sensing. Of course, I think what we discover about immersive experience, architecture and sound, and spatiality in music can extend far beyond just this system. Spatialization Examples : 1 from 4DSOUND on Vimeo. What’s possible when the experience of sound can happen in more dimensions? We invite artists and hackers to explore the 4DSOUND system using a variety of tools of their own choice, culminating in new experiments in sound, music, and performance. Previous experience in all of these tools is not required. Artists and coders alike are welcome. You might be a musician interested in exploring your instrument or voice with a spatial interface, or an artist interested in making visuals on the surface. You might be a coder or patcher eager to explore new tools. You might have some novel technology you would like to interface with a spatial sound rig. Perhaps you’re doing something completely different we haven’t thought of! We regret that we can’t provide other expenses. Travel and accommodation is the responsibility of participants. However, there’s no charge to participate. To apply, fill out the entry form by 23:59, Sunday 14 September, and let us know a little bit about your work and skill set and what you hope to accomplish. We will select a group that we think can collaborate well on the system and that represents a variety of interests. Accepted participants will be notified that week. We look forward to meeting some of you in Amsterdam!